Dear Thay, dear Sangha In March, my partner and I were fortunate to spend five days at Deer Park Monastery. One evening after dinner we noticed a group of nuns, monks, and lay friends playing volleyball. My partner, who played on a college team, wanted to join them. I agreed—in spite of my aversion to team sports and perception of myself as uncoordinated. Stepping onto the court, I was horrified to feel like my gangly junior high school self, terrified of the ball and my teammates’ mockery and derision. Yet as we played, I noticed that the sisters and brothers on “my team” didn’t react at all when I avoided the ball or hit it askew. There were no shouts of judgment or praise, no competition, no ambition. Instead, I noticed laughter, silence, relaxed ease, and neutrality. The monastics were practicing equanimity in volleyball. Whatever happened, they genuinely didn’t mind. In their presence, I was able to acknowledge my fears, gently set them aside, and wake up to the present moment. I watched the ball fly back and forth. I responded naturally when it came to me. After the game I knew a very old wound had begun to heal. “Live in joy and in peace even among the troubled,” the Buddha said. “Live in joy and in freedom as the shining ones.” Monks and nuns make a commitment to do just that. In a world overrun with trouble, they dedicate their lives to embodying and teaching peace and compassion. It’s no wonder their very presence fosters spontaneous healing. In this issue on Monastic Life, ten sisters and brothers share candid and compelling personal stories. They speak of obstacles, epiphanies, and aspirations. Authentic and insightful, these writings are precious gifts from the vibrant heart of the Sangha body. If you are inspired by these stories and interested in monastic life, be sure to read the invitation to “Step into Freedom and Taste True Happiness” through the new Five-Year Monastic Training and Service Program (page 45). May this issue be a dear companion and guide on your path of peace. On a warm and beautiful spring morning, nature is cheerful, with birds singing a happy welcome to the sun that is somewhat shy on the eastern horizon. Flowers awaken from their sleep, and their petals start to bloom when the warm sunshine greets them. Dewdrops freshen the blades of grass, which sway beautifully. A beautiful plum tree stretches her branches when the wind gently blows against her, as if to say “Good morning!” In her branches there are not just two or three but thousands of flowers. Bees are very happy as they dance and sing among the flowers of the plum tree. And the plum tree also sings and dances with the bees. All the people who see the plum tree stop to admire it; they breathe in mindfulness, and their joy waters the seeds of compassion and love in the plum tree. The plum tree is always smiling and joyful because she has all the happiness she needs. She enjoys every happy moment. The love and compassion that she receives gives her spirit energy to endure a day that is full of challenges. Until one day, when her petals start to fall. The plum tree is very sad and asks the flowers not to leave her, because without the flowers the bees will sing and dance no more and people will not stop to enjoy her beauty. The plum tree fears she will feel alone and people will no longer give her love and compassion. The plum tree does everything she can to keep the flowers from falling ... but they just keep falling. The flowers are also very sad. They do not want to leave the plum tree, and they try to make her feel better by promising to come back again. s the days pass, the plum tree becomes very sad and cries a lot, asking herself why the petals had to fall away and why the flowers could not stay forever. When the warm sunshine comes and the green leaves dance on her branches and the wind says hello to her, she tries her best to welcome them and enjoy their presence. But when the sun sets, the leaves fall asleep, and the wind says goodbye, she is sad again. She hopes the flowers will come back and make her beautiful so that she can be happy again. Day after day, the plum tree smiles insincerely until one day a few children come close to play. They caress her trunk and sit upon her roots. They talk with each other cheerfully as they point to her branches. The plum tree didn’t realize until that moment that her leaves were wonderfully shady and that the flowers she grieved for had transformed into a sweet fruit. The plum tree smiles lovingly as she greets the leaves and fruit upon her branches. Aware of the beauty of the fruit upon her, she realizes that the flowers never left her, that the flowers are always with her, only now they have manifested in the form of sweet fruit. She realizes that the flowers were impermanent and, thanks to this impermanence, the fruit that she now bears has had a chance to manifest in the plum tree’s life. If the petals had not fallen, there would be no fruit present in her. After this realization, the plum tree understands that the leaves, flowers, and fruit are not separate from her: they inter-are with her. All things that come and go throughout life offer beauty, if only we can open our eyes and hearts to see it. Sister Trang Moi Len, True Rising Moon, lives in the New Hamlet of Plum Village. Before being ordained in Plum Village, she practiced with Bamboo Raft Sangha in Indonesia. By Leslie Rawls and Carl Dunlap, Jr. To our respected and beloved teacher, Thay Nhat Hanh, and to the stream of ancestral teachers who have preserved and transmitted the teachings, we offer an ocean of gratitude. December 5, 1988 was the coldest, darkest day of my entire life. I committed the vile act of murder and was eventually sentenced to life in prison. Taking a life never resonated well in my heart at all. Because I was raised a Baptist Christian, I knew that for forgiveness, I had to sincerely repent and draw closer to God. However, during my Christian experience, something didn’t feel complete. I began asking questions. Why are we the only ones that will be saved when this God comes back and destroys the entire earth? You mean to tell me that this great loving Creator gave us life and is now saying if you don’t believe in a certain way, he is going to destroy us and torture us in a burning hell forever? It sounded absurd. So I found the confidence to explore other ways of life and tried to find peace in my heart, while being someone who could make a positive effect on life. The name of that book was Being Peace by Thich Nhat Hanh. The book was incredible. Thay offered so many precious jewels of wisdom that were simple and liberating. I knew this was what I wanted to do. What really sold me is the fact that Thich Nhat Hanh says that his teachings are not to fight, kill, or die for. They are only a way to develop understanding and compassion. Thich Nhat Hanh says if his teachings are for you, then use them, and if they are not, then abandon them. Man, what humility, style, and grace. After reading Being Peace, I asked Daniel how could I be a part of this Sangha and be filled with the teachings of liberation. Daniel said, “Next week we will be starting a Sangha here and Leslie will be coming in to teach.” I went to the meeting and was absolutely amazed at Leslie’s composure and sincere compassion about humanity. I wanted to cultivate that in my life and be a solution to suffering and be helpful as well as compassionate to every being I encountered. After attending meetings for a little over a year, I received the Five Mindfulness Trainings in a beautiful transmission ceremony. The transmission was very important to me. My family, friends, and peers noticed a very big change in my life and I owe it all to the practice. Being in the practice taught me to be mindful in all my actions, to be aware in each living moment. Because I practice, people see me as someone who strives to relieve suffering in myself and others. Never in my wildest dreams could I imagine the effects of being mindful about how I ate, breathed, walked, sat, or lay down. It is an awe-inspiring experience. Now my daily life, as I practice, is filled with being aware and staying in the present moment, never worrying, just trying to be present, and taking care of each moment as situations arise. In this dog-eat-dog world, people are motivated by many different things, which leads them to be suspicious of true kindness. For example, my job assignment here is commissary clerk in the kitchen. The job only requires for me to pass out food, be prepared for that day, and keep inventory on the stock. Well, one day, I noticed a big pile of pots and pans heaped around the sink. My mind immediately went back to something Thich Nhat Hanh had said: “When we wash dishes, we are aware that we are washing dishes.” I said to myself, “What a perfect time to practice being in the present moment and be aware that I am washing dishes.” I poured myself into it and experienced the beauty of being there and taking my time to wash every pot and pan there, and the ones that continued to come. About an hour and a half went by and the guy assigned to washing dishes came back, expecting to walk into a big load of work. To his surprise, everything was caught up and clean. He asked, “Which supervisor told you to do that?” I told him nobody asked me to do it and I did it on my own. He then asked, “Well how much do I owe you, because nobody does anything around here for free.” I smiled at him and said, “You don’t owe me anything,” as I walked away. Because for me, as I was there in the present moment, I imagined myself at Plum Village, serving with my brothers and sisters, washing dishes with a big smile on my face. Aware that words are just labels and they don’t depict who we truly are, I don’t go around with a big sign around my neck saying that I am Buddhist. Therefore, it was quite refreshing to encounter my next experience. One afternoon, an officer approached me and asked me to sit in the infirmary with a man who was dying of cancer. The nurses were understaffed and they needed someone to just sit in the room with him, in case he tried to get up out of bed because he was so weak and he could not walk on his own strength without falling down. While sitting in the infirmary with him, I thought of impermanence. Old age, sickness, and death are certain to come for everyone. Also, I knew it was not a time for words so I just simply sat with him and occasionally, he would smile. When he spoke, I just listened and let him know that I was there for him. My daily life consists of practicing the principle of dwelling in the present moment and staying mindful of my breath. Throughout the day, I smile and try to handle everything with the correct attitude. I’m not always successful, but just being aware of the process of unwholesome seeds when they are present helps out greatly. My appreciation for the practice is boundless. My teacher, Leslie, is a beautiful person who takes the time to teach me with compassion. I am truly honored, with much humility to be her student and dear brother. Our Sangha has supported various inmate North Carolina Sanghas for years. For over a decade, the distances kept me from participating more than a few times annually. A few years ago that changed. Daniel, an inmate I knew from a mountain prison, transferred to Piedmont Correctional, about an hour away from me. And Daniel began to build a Sangha. I came only a few times before going to Plum Village to receive Lamp Transmission. When I returned, I was surprised to learn that Daniel had transferred out. But Daniel had started the wheel of practice. Our tiny inmate Sangha now meets every Monday, thanks to Daniel’s initial push, the energy of our practice, and the ongoing support of Chaplain Michael Haynes. Thirty-nine-year-old Carl has been a Sangha regular since we began. Because he is serving a life sentence and North Carolina has abolished parole, we can expect that he may never be on the outside. Carl has told me that sometimes he wishes he could be outside, so he could visit Plum Village and practice with the Sangha. He also recognizes that his practice is very helpful to people right where he is. In the years since the Sangha began, Carl’s practice has blossomed. I have seen tension lessen in his face, seen him walking mindfully and peacefully, and heard from those he lives with about how his practice affects others in the prison. One Monday when Chaplain Haynes was out, another staff member oversaw our small group. As we packed away our blankets and inflatable cushions, the staff member commented on how peaceful it had been to sit with us. (He had been across the room, behind a desk, trying to keep his chair from squeaking.) Then, he spoke about Carl, telling me that Carl is a source of peace to other inmates, guards, and staff. He too had seen the strength of Carl’s practice. Other times, I’ve seen Carl listen to Sangha members with a tender heart and respond with words of compassion and understanding. His practice offers a rare and sorely needed balm for troubled hearts. A regular in our Piedmont Correctional Sangha has asked, more than once, why I come. I have no words to answer, and sometimes tell him, truthfully, that I don’t know. But my heart knows that it’s something like this: I come to the prison every Monday because transformation is possible through these teachings, because everyone matters, and because transformation, like happiness, is not an individual matter. Leslie Rawls, True Realm of Enlightenment, is a founding member and the Dharma Teacher for the Charlotte, North Carolina Community of Mindfulness. She received Lamp Transmission from Thich Nhat Hanh during the 2008-2009 Winter Retreat in Plum Village. She edited the Mindfulness Bell from 1996 to 2001, and currently serves on the magazine’s Advisory Board. Carl Dunlap, Boundless Compassionate Heart of the Source, was raised in Winston-Salem, North Carolina. He practices every week with the Extended Charlotte Community of Mindfulness Sangha in Piedmont Correctional Institute. He is the father of two and an aspirant to the Order of Interbeing. Old Path Sangha began as Old Path Zendo, which was founded by dedicated Order of Interbeing (OI) members Judith and Philip Toy. The Toys followed the traditions of Thich Nhat Hanh and also had a strong and elegant sitting practice in the Rinzai tradition. I loved chanting the Heart Sutra in old-fashioned Japanese, a practice that has continued at OPS even to this day. When the Toys decided to retire in North Carolina to be closer to their family, I vowed to keep weekly meditation practices going at the zendo. Without hesitation, I moved out of my home in a nearby town in western New Jersey and moved into the zendo, located in a 200-year-old stone farmhouse on sixty acres in Bucks County, Pennsylvania. The next year was spent hauling wood from the woodshed to the living room to keep a fire going when the Sangha came for sitting practice, clearing cobwebs, dusting, scrubbing floors, and preparing snacks—all to make whoever showed up feel at home. It was simultaneously exhausting and gratifying. During that year, I received a deep and profound lesson about “protecting the Sangha.” I learned to look deeply at, and to overcome, my resistance to being committed to the Sangha. I realized that commitment—staying with the good and the bad and accepting the way things are—was one of my biggest issues. I felt torn by the competing obligations of home, work, family, school, and the Sangha. In learning to be there for the Sangha, I learned how to be there for myself and others. I learned the joy of giving, and I also learned the necessity of sometimes saying “no,” knowing that preserving my energy was an act of self-love. Initially, I found this hard to do; my needs for space and rest seemed at odds with the Sangha’s survival. I realized, though, that I could be a better Sangha member and a healing force in the Sangha by respecting my limits and not judging myself; that self-love, at times the hardest thing, is the practice of love. After a year of juggling graduate school, family obligations, and a full-time job as a lawyer-lobbyist, I moved out of the old stone farmhouse and back into my home in western New Jersey. Once I moved from the zendo, it was time for our group to transform. We took the name Old Path Sangha and began to look for a home. We found our new home in tiny St. Philip’s Episcopal Chapel, located next to a beaver pond and wetlands in the small artists’ community of New Hope. The chapel hosts an eclectic mix of groups, including the Beaver Pond Poets, AA, a Bible study group, and many others. Our relationship with St. Philip’s and the current vicar, Rev. Peter Pearson, is a living example of its motto, “Radical Welcome.” Once planted at St. Philip’s, our Sangha, a tiny seed of hope, slowly began to grow. We come to the Sangha with our very busy schedules, family obligations, and full-time careers. Despite the ups and downs we have faced over the years—divorce, career changes, sickness, the deaths of parents and other family members, and the general stuff of life—we hold fast to the belief in the healing power of a community united by love. We recognize that we support the Sangha and that the Sangha supports us. We cherish the teachings, knowing that the fruit of the teachings is an open heart and mind. We have relied on the practice of Beginning Anew to resolve small and large conflicts that threatened to tear the Sangha apart, promoting understanding, the root of love. We have studied the Five and the Fourteen Mindfulness Trainings to develop our understanding of and compassion toward ourselves and others. At each Sangha sitting, we share Thay’s inspirational words from his many books, and find this especially helpful when one or more of us faces life challenges. As a Sangha, we have attended five-day, weekend, and day-long retreats, building community and togetherness. We have shared many, many Sangha potluck gatherings to strengthen our bonds of friendship. Although we remain small, we have nurtured connections with area Sanghas, hosting days of mindfulness throughout the Delaware Valley. We are part of an interfaith community in Bucks County and have participated in interfaith events with other religious organizations. Some of our members have realized their aspirations to serve the wider Sangha by becoming OI members. The work of building the Sangha garden, much like cultivating a vegetable and flower garden, has been slow and steady, attending to the very foundations of the Sangha: understanding and compassion. Over and over, we have agreed to recommit ourselves to the Sangha, to come together to practice understanding, peace, and compassion, not just in our weekly sessions, but in our jobs, with our families, and with others. Over and over as a Sangha, we have recommitted ourselves to live our daily life in mindfulness. That tiny seed has grown into a healthy plant with deep roots and vibrant green leaves that has sustained Sangha members, visitors, the New Hope community, and area Sanghas. We have transmitted positive seeds of our practice to all we come in contact with, friends and strangers alike. At our tenth anniversary celebration, Dharma Teacher David Dimmack remarked that a Sangha is “revolutionary.” OPS has indeed brought about a revolution in the way our Sangha members act, speak, and think. OPS, like any family, has been through many changes. People have come and gone. There were times I thought our small, newly formed group would not survive. There were times when the Sangha felt too tiny to survive. I worried that my energy level and the energy of other members were not up to the task of sustaining a Sangha. I worried that the many competing obligations of family and work would overwhelm our desire to practice in community. Settling in the tiny artists’ village of New Hope, the Sangha seemed unlikely to find others interested in practice. In coming to accept the smallness and fragility of the Sangha, I have come to understand those parts of myself that are similarly small and fragile. The effort of sustaining a small, fledgling community of practice has allowed me to look directly at my fears, my aspirations, and larger societal messages that say “bigger is better.” In tending OPS, a tiny Sangha in a tiny chapel in a tiny artists’ community, I have been nurtured in very big ways by the support of the Sangha. Thay has said that the Buddha of the twenty-first century may manifest as Sangha. Our Sangha, a tiny yet dedicated core group of members, comes together to practice mindfulness as a community of love, peace, brotherhood, and sisterhood. Building a Sangha takes time. Ten years is just the beginning for Old Path Sangha. It is a lotus flower to our community and to the world. Valerie Brown, True Power of the Sangha, is a founding member of Old Path Sangha in Philadelphia. Vancouver is preparing for a truly historic event—our beloved teacher, Thay, along with forty ordained Sangha members, is coming to give a public talk and lead a retreat in August 2011. We are so excited! Situated on the west coast of British Columbia (BC), Canada, Vancouver is one of the most beautiful cities on earth. We truly feel blessed to host this special event in a city surrounded by so much natural beauty—mountains, forests, and the sea. Thay was last in BC in 1987, for a small retreat in White Rock. His teachings were from the Heart Sutra, and led to his wonderful book, The Heart of Understanding. At that retreat, there were only eighty-five attendees. Thay was able to connect with his students in a far more personal way than he can do today. At our retreat this August, we shall be hosting over 800 residential guests at the University of British Columbia, with 2,300 attending Thay’s public talk. He will definitely not be able to come around and correct our sitting postures, as he did in White Rock nearly twenty-five years ago! The Mindfulness Practice Center (MPC) of Vancouver was set up in 1998, after my husband John and I returned from the twenty-one-day retreat in Vermont. Thay asked attendees to go home and set up non-Buddhist MPCs. Vancouver’s was the second in the world, after Pritham Singh’s and Anne Johnson’s lovely center in Vermont. Over the years, MPC has changed from a fairly structured, welcoming space in a nice residential area of the city to a casual, friendly drop-in group in the heart of our downtown East Side. This area is one of the poorest postal districts in the whole of North America. It’s where a large number of homeless folk live, many of whom are drug users and prostitutes. Because there appears to be such helplessness on the streets, it can be a frightening location for some people. A number of Sangha members who used to come to our first, more suburban location, now no longer come, mainly because of their fears of perceived dangers of the new area. However Thay teaches us that 80% of our perceptions are incorrect! Personally, I do not have a problem with our new location, as homeless folk give me no reason to be scared. Often they ask for money, possibly wanting to purchase their next pack of cigarettes or a bottle from the booze shop. I never give cash, always offering instead to go and buy a coffee with a sandwich. Having the Sangha meet in this area makes me much more grateful for all the gifts I have in my life: a solid, supporting family, a roof over my head, and food on my table. It helps reinforce one of my daily practices of gratitude, the first always being: “Today I am grateful for my life and breath.” Without these two gifts I could no longer be grateful for everything else in my life. A very deep practice also comes with our preparation for the upcoming retreat, which requires a lot of hard work from a number of very generous and kind volunteers. When I was a very new Order of Interbeing member, a wonderful senior practitioner told me how family was her hardest practice. Well, my practice and our committee’s practice have been stretched, sometimes to the limit, as old habit energies come up—unfortunately the ones we don’t admire in ourselves. My volunteer family is stretching my practice and helping it grow on a daily basis. I have to thank all of my dear volunteers for this; they are indeed the flowers in my garden, helping me to pull out the weeds in my mind. This process has been greatly helped by the kind leadership of several of Thay’s senior monastics. The main direction for our mindful decision-making has come from our liaisons with some amazing monks and nuns in Deer Park. We could never have done any of this work without their tremendous loving kindness! We have also received great joy and nourishment from the volunteers within our larger Northwest Pacific Sangha, and I give them a deep bow of gratitude. For details about the Vancouver retreat, please visit www.tnhvancouver2011.org. Jeanie Seward-Magee, True Virtue and Gratitude, B.S.W., resides with her husband John on Bowen Island, British Columbia. She is a writer of newspaper articles and books, and a Mindful Way Course presenter. Five-Year Monastic Training and Service Program When we train as a monastic we have the opportunity to find the root of our freedom, solidity, joy and happiness, and to help our society. When we ordain and wear the brown robe, we learn to cut through our illusions and our afflictions. We learn to transform our deepest suffering into a bright future and into an even brighter present. In this process of knowing ourselves and facing our difficulties, we will also learn how to change our society into one that is more compassionate, understanding, and happy. This is a natural process, because as we discover the root of virtue in our own life, we will also be able to help other people to stop creating suffering for themselves and for the world. Five years of monastic training is a great chance for you to learn how to live your life meaningfully, to discover brotherhood and sisterhood, and to make possible right here and right now the social change we have always dreamt about. Tasting the simple life of a monk or a nun and cultivating your spiritual life, you will be able to assist your elder brothers and sisters in organizing retreats and events all over the world. You will be able to share your practice and transformation and help a great number of people. When we let go of the pursuit of wealth, power, and sensual pleasures, and put on the brown robe, we do not need to wait five years to be able to help people. Right from the first day, we inspire those around us by simply walking with mindfulness, solidity, and freedom. Age from 17 – 32. If you are under 18, you must have the consent of your parents. Single or divorced. Your relationships with those close to you are settled, and your decision is in harmony with them, so that they will not be an obstacle to your training as a monastic. No incurable disease or serious medical condition. Your mental stability and physical health should be sound enough not to be an obstacle for your training and for that of the community. No debt or financial ties.As monastics we take refuge in the Sangha, and do not have debt or hold bank accounts and/or credit cards. Commitment to study, practice, and serve. Our training is to flow as a Sangha. You commit to learn how to practice as a community and to follow the guidance of the Sangha, including attending all Sangha activities. Letting personal possessions go. As part of your training you will be asked to release items such as laptops, cellphones, etc. and to come into the community with your hands empty. Family visit. You can visit your blood family members for fourteen days after training for two years as a novice. You can keep in contact with them by writing letters and calling them from time to time. Come to any of our centers in the U.S., France, Germany, and Thailand and practice as a retreatant for two weeks before inquiring about the program. Please visit www.plumvillage.org for a more detailed description of the Five-Year Monastic Training Program. A documentary about monks and nuns on tour with Zen Master Thich Nhat Hanh Twenty-five hundred years ago the Buddha walked the length and breadth of India, sharing the Dharma and the way of compassion and freedom. In 2011 the monks and nuns of Plum Village will take to the road with the same goal in mind, but this time using planes, trains, automobiles, social networking, and mobile phones. Traveling to the U.S. with Thay and the monastic delegation, a team of filmmakers will experience the tour side by side with these monks and nuns, creating a unique feature-length documentary to share the real lives of monastics in the Plum Village Tradition: their stories as young people with aspirations, hopes, and dreams; their trials and challenges along with their joys in the practice. By following Thay and the monastics of Plum Village from large-scale public talks and retreats to personal encounters, we will gain a rare insight into the deep teachings of a true modern Zen Master. From the natural beauty of sunny Southern California to the swamps of Mississippi, from the Rocky Mountains to Manhattan, this will be a road movie like no other! The film will be directed by Max Pugh, a young filmmaker with a track record of award nominated films. 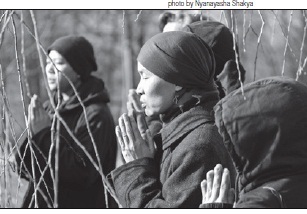 The making of the film and its content will be guided by Plum Village monastics. The filmmakers want you to get involved! They are conducting a campaign to raise $30,000 to cover production costs. They are offering a unique opportunity to become part of this extraordinary film. To see all the wonderful things offered in exchange for your support, go to http://www.indiegogo.com/tnh. In August 2009, more than nine hundred people gathered at the YMCA of the Rockies in Estes Park, Colorado, for a five-day retreat with Thich Nhat Hanh, entitled “One Buddha Is Not Enough.” I was one of them. Many of us had read Thay’s inspiring books or heard his lectures, and we were looking forward to seeing and hearing him in person. That first evening, we learned that Thay would not attend because he was hospitalized in Massachusetts, where he had led a retreat the week before. Many participants were disappointed, but they also appreciated the situation. Over the next four days, the retreatants as well as the coordinating monks and nuns made the retreat a delightful experience for all. Every day we listened to Dharma talks and chants, ate our food mindfully, and sat and walked in the silence of mindfulness. An account of our experience has been published in this elegant volume. The book consists of an introduction about the Colorado retreat (“The Miracle of Sangha”), nine chapters by the monks and nuns (texts of their Dharma talks at the retreat), an excerpt from the hospital diary of one of the monks who accompanied Thay (“You Continue in Us”), two letters from Thay that were read to retreat participants, and a final chapter written by Thay (“We Have Arrived, We Are Home”). Reflections and remarks by retreat participants are included, giving a people’s voice to the book. Overall, this is a carefully crafted, absorbing read. Happily, the book preserves the sense of humor that was present at the retreat. Filmmaker Eloise de Leon promises Colors of Compassion will be a cinematic retreat. It is that. In this documentary that chronicles Thich Nhat Hanh’s 2004 People of Color Retreat, we walk with our teacher through Deer Park Monastery’s tawny landscape. The camera pans and then stops. We breathe. We hear a bell, a bird. Those who speak on camera identify themselves as Mexican, African American, Vietnamese, and mixed with other cultures and nationalities. They share why they came and where they came from: “We can feel that we know our parents and our ancestors, and still we ask the question, who am I?” “The color of our skin or what we are categorized as, it doesn’t make us. If we are not skillful, it can confine us.” “How to not abandon our communities and be a mindful social activist is the crucial question for our liberation.” Their stories also answer questions some might have about a retreat for people of color. Why do we need such a retreat? Why might someone like me need the Dharma? The filmmakers skillfully balance talking and stillness in wonderful scenes: Thay teaches interbeing to a room full of brothers and sisters—some in robes and some not—in the Ocean of Peace meditation hall; and, at the end of the film, during an extraordinary celebration, many receive the Five Mindfulness Trainings and their Dharma names. Perhaps some will find their way through this film into practice, and others will appreciate the vibrancy of people of color, who may have been invisible until now, in their own Sanghas. The Ten Oxherding Paintings have helped Zen students conceptualize the path to enlightenment for almost one thousand years. Attributed to Kuoan Shiyuan, a Chinese Zen master, they depict a young child (the spiritual seeker) searching for an ox (the true self) and his eventual attempts to control it. In this fresh look at familiar teachings, Venerable Thich Phuoc Tinh doesn’t waste any time; he confronts us with the simple truth: “the joy, the enlightenment, the nirvana, all those things are already within us.” The ox is not somewhere else; it just appears that way to the confused child who continues to search. When I began practicing, I also spent too much time searching outside of myself—for teachers, retreats, books, etc. I didn’t understand about coming back to the beautiful island within myself. Only later did I discover the space of mindfulness that was always here in my body and my mind. There is truly nowhere to go and nothing to search for. Whatever we have been looking for has always been right here, inside of us. We can enjoy these profound teachings, enter the mind of our wonderful teacher, Venerable Thich Phuoc Tinh, and dwell in the Buddha nature that has always been within us.